One view of the exhibition, "UNTITLED-second-nature (Te Kore-Rongo-Hungaora)". "Te Taiao Māori" (The Maori World/Environment) text on wall, 2011 by Te Huirangi Waikerepuru (Tribal affiliations: Taranaki, Whānui, Nga Puhi, Taitokerau), flanked by four speakers which are the soundpiece, "Te Kore Street of Breaths" by Sophie Jerram and Dugal McKinnon. On the left is "Mauri Wai Mauri Ora" (Water Energy, Life Energy), Taranaki volcanic stone + acrylic by Jo Tito (Tribal affiliations: Taranaki, Ngāti Pikiao, Tūhourangi-Ngāti Wāhiao). On the floor are one of the star shaped "Photo Astronomy," telescope photographs by Paul Moss. New Zealand had a major presence at the 2011 InterSociety for Electronic Arts event with the exhibition, “Uncontainable-second-nature (Te Kore-Rongo-Hungaora).” At ISEA it contributed to expanding an ongoing dialogue of electronic artistic practice in an international context. Lanfranco Aceti, director of ISEA Istanbul created an ideal forum for the experience of electronic art by locating 5 of the 8 exhibitions within the centrally located Istanbul Municipal Gallery (Taksim Cumhuriyet Sanat Galerisi). Poster outside the Istanbul Municipal Gallery (Taksim Cumhuriyet Sanat Galerisi), Taksim Square, Istanbul. 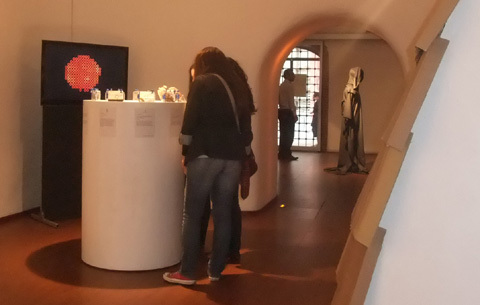 It is one thing that this ISEA event was connected with such an international event in the art world but there were also conceptual connections on a number of levels made between the two exhibitions. Aceti used the title “UNCONTAINABLE” as an umbrella term for the independently curated shows, of which the New Zealand-Aotearoa show was part, while the Istanbul Biennial used the umbrella term “UNTITLED” – a reference to the American-Cuban artist, Felix Gonzalez-Torres whose use of this term referred among other things, to the influences of cultural hegemony in naming and categorizing. While the Istanbul Biennial took a more literal route, also in the way each of the mini-shows were named after a particular work by Gonzalez-Torres, Aceti’s title “UNCONTAINABLE” touches on the ‘in-tangible’ inviting us to ask questions about what is contained to begin with, or how does electronic media ‘contain’ or ‘colonize’ in today’s world. The subtitles for each of the independently curated shows expanded this notion of ‘the ability or inability to contain’ in an organic manner. The New Zealand show subtitled “second-nature” at face value seems to be a reference to othering or alternative nature and in some ways it was, if one’s only point of reference are western cultural values. Just as Aceti responded to the theme “UNTITLED” and expanded on this by use of the word “UNCONTAINABLE,” the New Zealand curator Ian Clothier’s use of the term ‘second nature’ does likewise as did a number of the works in the show. "Te Taiao Māori", text on wall, 2011 by Te Huirangi Waikerepuru (Tribal affiliations: Taranaki, Whānui, Nga Puhi, Taitokerau), flanked by four speakers which are the soundpiece, "Te Kore Street of Breaths" by Sophie Jerram and Dugal McKinnon. On the left is "Mauri Wai Mauri Ora" (Water Energy, Life Energy), Taranaki volcanic stone + acrylic by Jo Tito (Tribal affiliations: Taranaki, Ngāti Pikiao, Tūhourangi-Ngāti Wāhiao). As you entered the space of curved arches and walls, you encountered a wall of 6 metres of text arranged similiar to a family tree, of words in Maori with English translations. Like a family tree there was an ancestor above branches. This work, “Te Taiao Maori” (The Maori Environment/World) by Huirangi Waikerepuru is a cosmology of what we can feel, hear and taste, a ‘second-nature’ where potentiality is the common ancestor and elements such as life, water, time, interaction, or matter are the offspring. 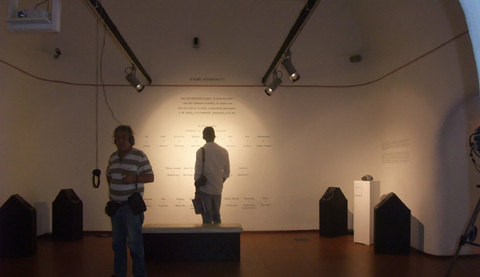 The wall of text acknowledging the natural world in the context of an international electronic arts show made an immediate impact on anyone there. While one could make analogies with even how programmers programme in levels, modules or processes -a blueprint for the electronic- what Waikerepuru was illustrating was another type of blueprint that functioned like a support or spine for the body of the whole show rather than as a container or means for categorization. Although the text appeared to be like hierarchy, in fact it was an arrangement of three systems beneath each other and the words he used in turn raised questions such as the role of the natural world with the digital. From this text flowed each of the artworks by the other artists. "Mauri Wai Mauri Ora," Taranaki stone, acrylic + text by Jo Tito. On the left side sat a volcanic stone (a kohatu or mauri, a special stone) bearing a painted motif reminescent of a wave by Jo Tito accompanied by a text connecting water to the flow of water within each of us. "Mauri Wai Mauri Ora", Taranaki stone, acrylic + text by Jo Tito. On either side there were speakers for the soundpiece “Te Kore Street of Breaths” by Sophie Jerram and Dugal McKinnon – a continuous audible starting and stopping of breath. Across from the text was Lisa Reihana’s video projection, "Whanaunga" (Relative) with a soundscape by James Pinker, featuring Maui (who brought a number of skills to the world of humanity such as the gift of fire) in the heavens and in water. "Whanaunga" (Relative), 2011 digital video by Lisa Reihana (tribal affiliations: Ngāpuhi, Ngāti Hine and Ngāi Tu) and sound by James Pinker. In the background is a detail of "Kāinga a roto," (Home Within) a five screen digital video installation by Sonja van Kerkhoff, Sen McGlinn and Toroa Pohatu. Reihana’s imagery oscillates between patterns, abstractions and a larger than life, Maui, a figure from the mists of time, as a surfer on the water. The title and surfing associations emphasize the present continuous. The soundscape (by James Pinker) – a rich orchestration of nuances and subtleties – could be read as an interpretation of a nature of continual presence akin to Waikerepuru’s use of the word “Papa-tu-a-nuku” (Revolving Earth) which emphasizes both the everyday, and natural and cultural history in one turn. Julian Oliver’s work “psworld” on the other hand takes a thimble of ‘ordinary’ water to enlarge on the extraordinary. Here a microscope not only facilitates the input for a computer, but nature controls the lifecycle of the computer. For this rendition of his work (see an earlier rendition), the microscope is focussed on protozoa in water which were projected on the wall. Their spontaneous and active movement determined the lifecycle of the (Linux) operating system which ran the computer. When there was too much variation in the movement of the organisms, the programme shut down the computer only to start it up again in order to repeat the process until nature closed it down again. Oliver has used the ‘ps’ function (used on UNIX-like operating systems as a way of showing in coded text what is happening on the computer as a means of testing its own system) to reveal this dependency between one system (the computer) and another (the natural world). In “psworld” coded text appear on the screen over the projection of the protoza informing us of the activity of the protoza as perceived by the computer. It is an exposed computer: vulnerable and dependent on a biological world in flow. A scattering of star shaped photographs taken with a telescope by Paul Moss were arranged between all of the works mentioned above. Left to Right: Detail of "Kāinga a roto" (Home Within), a five screen digital video installation inside a curved construction by Sonja van Kerkhoff, Sen McGlinn + Toroa Pohatu; "One man is an island," (obscured) a 6 minute and 40 second high definition video loop by Rachael Rakena (Tribal affiliations: Ngāi Tahu, Ngā Puhi); Text by the curator, Ian Clothier; "Computational Visualization of the Electromagnetic Sensory World of Sharks," 3-d modelling and animation, 2008, by Mike Paulin, and part of "Energy comes from the sun," hardware, software and digital display + 9 waterproof camera cases with texts with texts and selected elements from specific locations along the Whanganui river by Julian Priest. 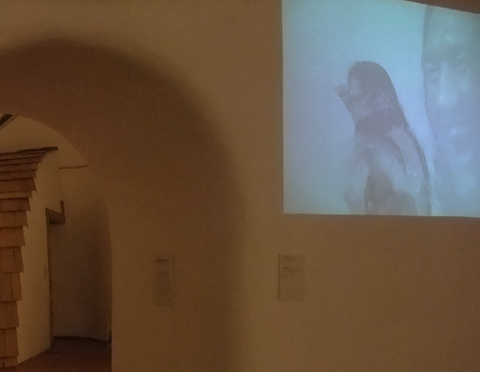 In the adjacent vaulted space, Mike Paulin’s video was a modelling of the electromagnetic sensory world of the dogfish shark (Squalus acanthias). As a zoologist his approach was empirical while the adjacent video, “One man is an island” by Rachael Rakena could be read as a poetic connection with Waikerekpuru’s cosmology. "One man is an island,", 2009, HD Video, 6 minutes, 40 seconds, by Rachael Rakena. The man stands comfortably in a transmuted sea or lake and seems so at home here that he eats a fruit he has picked from its surface, taking no notice of his reflection on the same surface. Rakena’s simple yet loaded imagery highlights the complex interactions between the natural world and human nature. The imaginary simultaneously estranges and makes connections. The man is both isolated – not in communion with his world, and yet also embedded, embraced and grounded. This duality also references Maori concepts of tapu and noa, of the energized, vulnerable yet unpredictable powers of nature as well as ways a person can attain balance or place within the ‘natural’ environment. "Energy comes from the sun," hardware, software and digital display + 9 waterproof camera cases with texts with texts and selected elements from specific locations along the Whanganui river by Julian Priest. Beyond is "Tele_Trust," 2009/10, by Karen Lancel + Hermen Maat (The Netherlands, http://www.lancelmaat.nl), in the "UNCONTAINABLE & Untitled" (http://isea2011.sabanciuniv.edu/other-event/uncontainable-untitled) exhibition curated by Lanfranco Aceti + Özden Şahin. On the left is a detail of "Kāinga a roto" (Home Within), a five screen digital video installation inside a curved construction by Sonja van Kerkhoff, Sen McGlinn and Toroa Pohatu. "Information comes from the sun" by Julian Priest consists of two parts: a circular plinth topped by nine transparent camera containers accompanied by a text placed on the plinth below each camera, and a visualization of solar power. "Energy comes from the sun" by Julian Priest in front of "Kāinga a roto (Home Within) by Sonja van Kerkhoff, Sen McGlinn and Toroa Pohatu. Each of the nine texts names a location, followed by a reference to an aspect of Maori cosmology not unlike the words used in Waikerepuru’s wall of text. 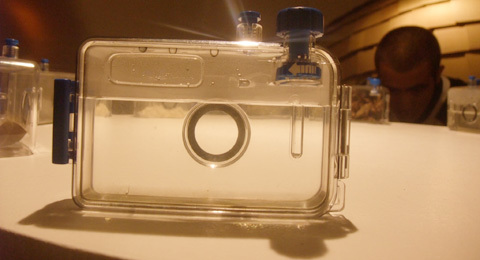 However Priest connects each concept, such as water (labelled “The Caressing Waters”) not only to a locality or materiality (for example, this water comes from Whitianga marae and a spring which only women may use) but also to a specific experience or description which relates to the object contained within the camera container. Detail of "Energy comes from the sun" by Julian Priest. Waikerepuru’s words give equal weight to the conceptual and the phenomenological, whereas Priest’s approach seems to be about diverse systems of ‘show and tell’ which seemed to be lost on most of the public. This was a work that needed some form of explanation for a public unfamiliar with New Zealand. A statement that all these locations were along the same river (The Whanganui River) would then help people to see the connections between location, forms of explanation (some texts were poetic, some encyclopedic) and the objects contained within. It was also hard to see the connection between the visualization of solar power in the form of changing orange zeros and the camera containers. The display was intended to correlate with the intensity of the sun’s energy in real-time. Perhaps the disparities, the contrasts and differences were the intent of the work. The title relates to the display of orange zeros while the various elements inside the cameras it could be argued, are the result of life, made possible by our sun. However the aspect of nature which seems to dominate in this exhibition is that of water. In the final work in the show, “Kāinga a roto” (Home Within),” a five screen digital video installation inside a curved construction by Sonja van Kerkhoff, Sen McGlinn + Toroa Pohatu, videos and soundscapes present rivers, the sea, waterfalls and rain as a recurring motif. And water flows throughout the show either via words, elements it has shaped (such as the sea worn stone) or visually in the various videos. Perhaps what is ‘second nature’ is not so much wai-rua, literally the second current, but that materiality (first nature) is more fluid than one might imagine. Intercreate.org, which lists all artists and some images. Lost point of view by Pim van der Heiden & Tellechea Velez, one of several performances at Villa Ockenburgh, Loosduinen, The Hague on April 10th 2011 by students in an artScience masters research group conducted by Michael van Hoogenhuyze. The “Harmony of the Spheres” was used as a starting point on the theme of the universal artist-scientist, that is someone who is not only both but believes that art and science fit into some order or ‘harmony.’ Before long, you realize that the 18th century Russian born Nadezhda Evgenova’s bio, theories about music and architecture on display or incorporated into visual or sculptural installations are romantic creations by the students. In short their works born of the imagination centered on the imaginary. Installation by Marijke van Gorp, Ludmila Rodrigues, Mike Rijnierse and Nenad Popov at Villa Ockenburgh, Loosduinen, The Hague, April 10th, 2011. A collective of artists who use this beautiful building as a studio space host bi-monthly events. See the Stichting Z website for more about these. To research Māori building and construction techniques, using the archives of Puke Ariki as well as via interviews with tangata whenua and visits to existing buildings and sites in Taranaki. Then with the material collected, we intend to build two structures, one intended to house a 5 screen video installation to be located inside (possibly Puke Ariki) and another that will function as a sculptural-shelter in Pukekura Park. We will combine what we learn from our research with other building techniques to create a hybrid work that straddles various worlds. Ecologically sound materials will be used either utilizing recycled materials, straw bales (perhaps the strawbale + clay building technique, a skill we have), or bales made from weeds or perhaps woven or bound flax. An aim in the choice of materials for the interior work will be to bring the outside (rural Taranaki) in and for the outdoor work we will be looking at reflecting something of the ‘inner’ world/s or make a play on inside/outside through a construction that functions as a sculptural intervention. If feasible, we will incorporate a natural process for the work to return to nature in the form of a compost-able work of art. Our goal while working on both projects would be to network and coordinate with others, either teaching skills as they help us or to make use of the knowledge or skills of others in the manner of workshops where the public can participate. Click on this to view it full size. Our aim for these constructions will be to see what we can discover about Māori construction techniques which will involve acknowledging the associated world views as much as any physical aspect, that could contribute to artworks addressing themes of translocation rather than to imitate any particular building form. It would also be our aim to do some outreach into the farming community in general as well, hence a starting point will be do see how we can incorporate hay or straw bales as a sustainable building material in relation to Māori architectural traditions. A video/sound and sculptural installation as part of an exhibition. Workshops could be given inside this space. Workshops to be given during the research part of the project where we could set up a studio space in Puke Ariki and the public can also engage with us while we are there. If we use Puke Ariki as a workspace we would give workshops at particular times so the public can participate in these. Likewise if we work at WITT then we could give workshops there for students or for the public. 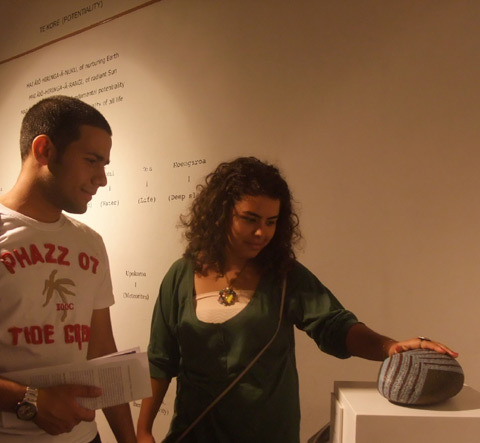 These workshops would be art oriented with a practical aspect. 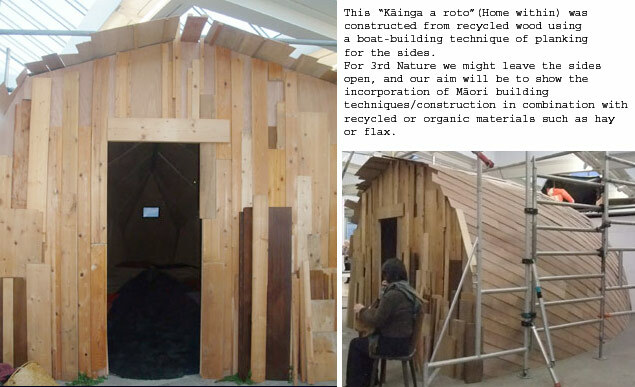 Sonja could also present a paper on the results of the research into Māori construction methodologies in relation to practices of sustainability and conceptual art. The construction in Pukekura park could house another work or exist in any location. It could be small (intimate) or like a shelter or room. We could do a pecha kucha presentation of the final project. Sen McGlinn and Sonja van Kerkhoff, both born and raised in Aotearoa (New Zealand) have been based in the Netherlands since 1989 and have been making art works independently, together, or in collaboration with others since the mid 1980s. Most of their work, often in the form of a site specific installation, relates to the human condition as an interweaving of the spiritual, social and material. For example in 2009 they participated in the “Treetop Gallery” in Regents Park in London, U.K., where Sen delivered a lecture in a tree house on “Structuring Society in an age of globalisation” while Sonja’s contribution was the hanging of orange tinted translucent tulips. Sen McGlinn, born 1956, Christchurch, Aotearoa / New Zealand. Sonja van Kerkhoff, born 1960, Hawera, Taranaki, Aotearoa / New Zealand. They live in Leiden, The Netherlands. 2012 “Into the line of Time” site specific installation, SPLORE arts festival, Tapapakanga Regional Park, Aotearoa/New Zealand. 2011 Performance, Yuchengco Museum, Manila, The Philippines. 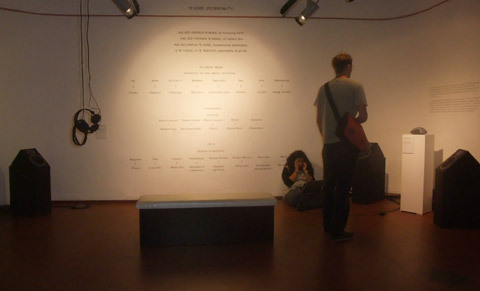 2011 Installation, Le Blanc Gallery, Manila, The Philippines. 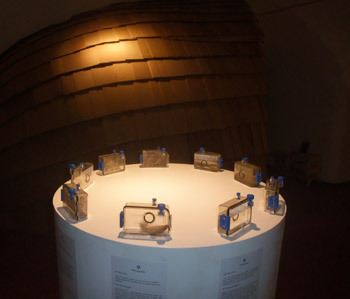 2011 Installation, ISEA Istanbul, Turkey. 2011 Print, Municipal Museum of Gwangju, South Korea. 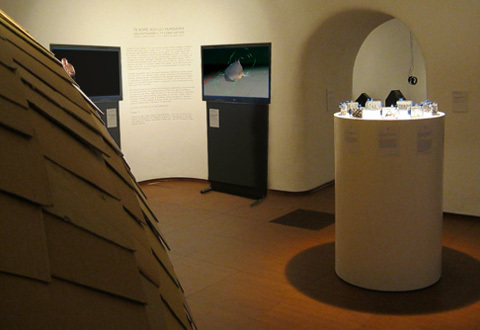 2011 Co-curation, EAE Gallery, Leiden, The Netherlands. 2011 Installation, Parlour Project Space, Queens Cresent, London, U.K.
2010 Installation, Museum Beelden aan Zee (Museum of Sculpture), Scheveningen, The Netherlands.